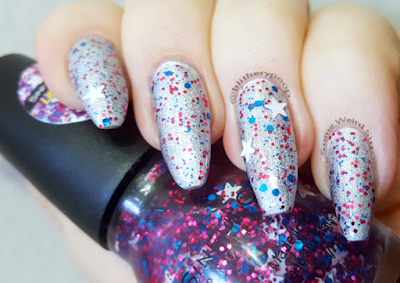 Starry Eyed has red and blue hex glitters and large white stars in a clear base. When glitter mixes have a variety of colors, finding undies for them can be tricky. 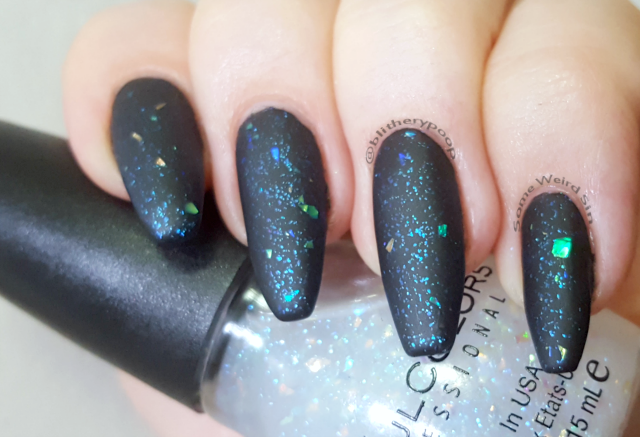 When I tested Starry Eyed over this dark blue, it looked like it worked. Once it was on and I walked from the bright light at my desk to the softer light in my photo spot, the little blue glitter was virtually invisible. Nerts. Luckily, a better base was literally right at my feet. 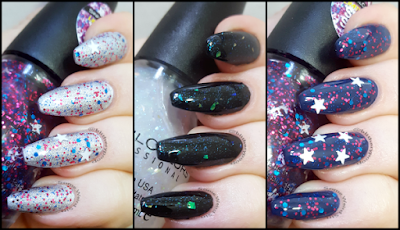 I hauled a few H&M polishes a few weeks ago, and Spacerace jumped out at me. 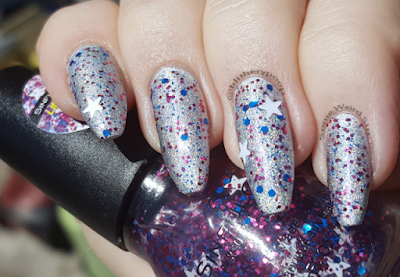 Over this subtle silver holo all three glitter colors are visible. Yay! So how was the application? 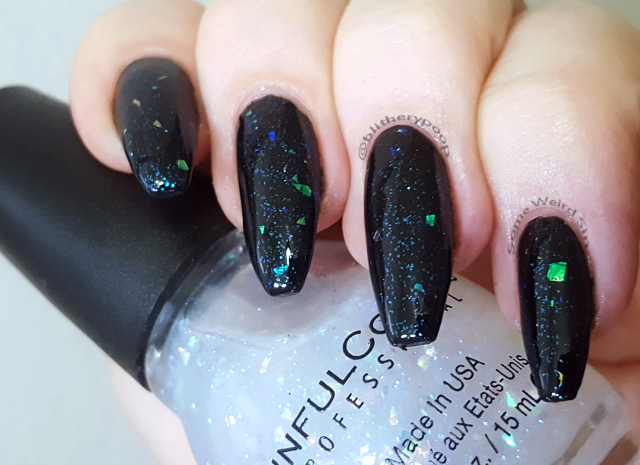 Just ok. Sinful Colors tends to have too much base/not enough glitter, and Starry Eyed has that issue. I had to do some dabbing to get the smaller glitters even. 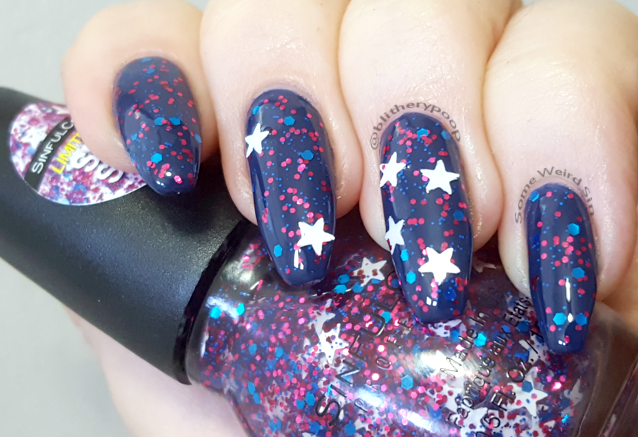 The stars have to be fished out and placed, but that's typical for very large glitter. Flame Game has blue microfleck and green-blue-orange shifting shards in a clear base. Gotta love a good topper! There aren't a ton of shards in Flame Game, but they're well-behaved. It doesn't take a ton of topcoat to smooth them down. They shift nicely too! The tiny, twinkling blue microglitter keeps the flakes from looking sparse. The whole look is really nicely balanced. The application's good too. No fishing, dabbing, etc. needed. The rest in this collection are reruns. 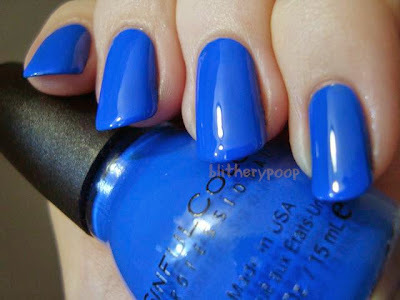 I have them all, but I don't have a swatch for Blues Cruz. Wish I'd realized that when I was swatching! Oh well. Here are the rest. Click on the names to visit the original posts. ...I really need to reswatch this! Bottom line: Yes to Starry Night, but louder yes to Flame Game. I feel like the red glitter in Starry Night could have been redder, right? It also needs dabbing, placing, etc., but we're used to that with these festive glitters. Flame Game really only works over dark bases, but it's really nice over them! As usual, I'm working on the Fourth. Ick. So have a hot dog or a burger and light a sparkler for me.